This example shows how to acquire and process live multichannel audio. It also presents a simple algorithm for estimating the Direction Of Arrival (DOA) of a sound source using multiple microphone pairs within a linear array. If a multichannel input audio interface is available, then modify this script to set sourceChoice to 'live'. In this mode the example will use live audio input signals - it will also assume all inputs (two or more) are driven by microphones arranged on a linear array. If no microphone array or multichannel audio card is available, then set sourceChoice to 'recorded'. In this mode the example will use prerecorded audio samples, acquired with a linear array. For sourceChoice = 'live', the following code uses audioDeviceReader to acquire 4 live audio channels through a Microsoft Kinect™ for Windows®. To use another microphone array setup, ensure the installed audio device driver is one of the conventional types supported by MATLAB and set the Device property of audioDeviceReader accordingly. You can query valid Device assignments for your computer by calling getAudioDevices method of audioDeviceReader object. Note that even when using Microsoft Kinect, the device name can vary across machines and may not match the one used in this example. Use tab completion to get the correct name on your machine. % to the initial position. The algorithm used in this example works with pairs of microphones independently. It then combines the individual DOA estimates to provide a single live DOA output. The more pairs available, the more robust (yet computationally expensive) DOA estimation. The maximum number of pairs available can be computed through nchoosek(length(micPositions),2). In this case the 3 pairs with the largest inter-microphone distances are selected. 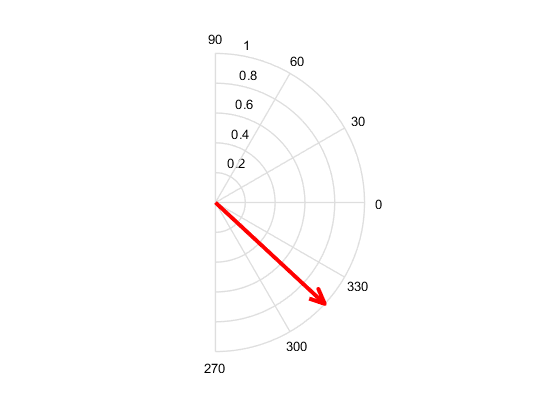 The larger the inter-microphone distance the more sensitive the DOA estimate. Each column of the following matrix describes a choice of microphone pair within the array. All values must be integers between 1 and length(micPositions). % display the estimated DOA live with an arrow in a polar plot. % The main algorithmic builing block of this example is a cross-correlator. % and hence to be handled by separate objects. For each iteration of the following while loop: read audioFrameLength samples for each audio channel, process the data to estimate a DOA value and display the result on a bespoke arrow-based polar visualization.